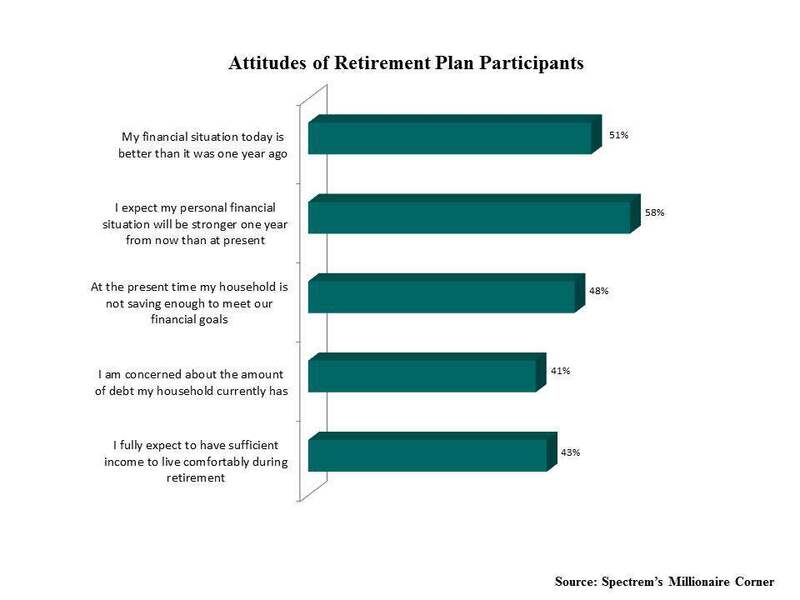 A Spectrem’s Millionaire Corner study of retirement plan participants finds confidence and concerns. At the same time, these participants also report hesitations about their retirement savings and household debt. Almost half (48 percent) said that their household is not saving enough to meet their financial objectives, while 41 percent said they are concerned about their current level of household debt. However, more than forty percent (43 percent) do expect to have sufficient income to live contentedly while retired. Fifty percent said that their financial situation is more improved than it was in the last year. Almost sixty percent said they expect their personal financial situation will be even better next year. Across generations, the youngest retirement plan participants surveyed by Millionaire Corner are the most assured in a protected financial future and have the largest beliefs they will be able to live contentedly in retirement. Also, they are the most worried about the amount of debt they are carrying. Retirement plan participants between the ages of 35-49 are the most concerned about saving enough to achieve their financial goals.